performance preparation, artistic expression, and musical literacy. ***Spring 2019 PROMO*** Sing with us all of January for FREE and then pay only $75 for the remainder of the semester! Black skirts, tights, & dress shoes for girls as well as black slacks, socks, and dress shoes for boys are purchased outside of Crescendo and are worn with the white polo for concert performances. Polos are returned to the choir at the end of the year. 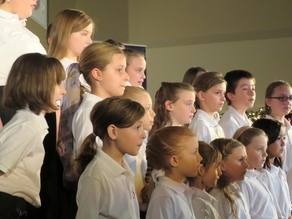 A performance-based program that builds on the musical literacy skills taught in Preparatory Choir with additional emphasis on performance, artistry, and professional-style musicianship. 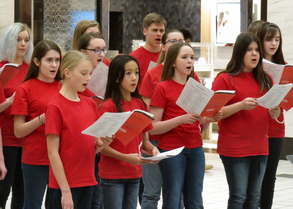 Girls in Concert Choir are asked to wear black, long-sleeved, crew-necked cotton shirts with black dress pants and dress shoes. The organization will provide each of them with a red choir scarf that is only worn at more formal events and returned at the close of the event. There is no cost for this item. Boys need to wear black, long-sleeved, button-down dress shirts with a red tie that is coordinated with the other male singers. They also need to wear black dress pants, black socks, and black dress shoes.